It’s finally spring (well at least the date tells us it is) and all the beautiful vegetables and fruits are starting to make an appearance at our grocery store. Our friend had brought some tomatillos over the other day, and we forgot to cook with them. Kinda sacrilegious, I know. This is a very easy, very child friendly recipe. B sat in the high hair while Z and I got down to business. 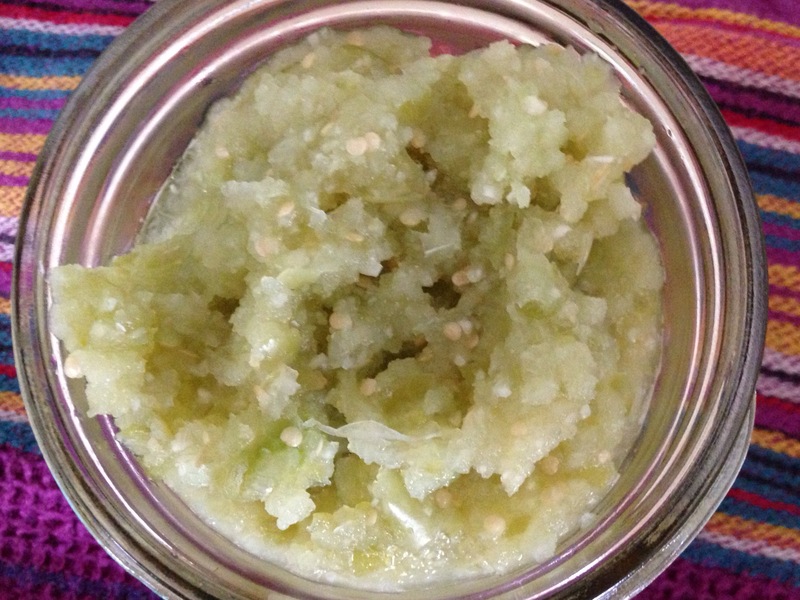 In a food processor, blend de-husked and washed tomatillos, onion and garlic until smooth. Add lime juice and jalepeno and blend until jalepeno is fully incorporated. Put in saucepan and cook over low heat for about 15 minutes. Salsa will reduce about 1/4. Add salt, stir and taste. To incorporate your kids, (Z is almost 5) I gave her a knife and let her quarter the tomatillos (teaches a little math) and let her add all the ingredients and blend. She then stirred the salsa on the stovetop, and added the salt. She made it really.